I'd bet that if you polled 10 PC users on the best way to use the desktop on Windows you'd get 11 different answers. How to use the desktop is one of the most personal choices each PC user makes. We've already covered ways desktop hoarders can better manage files that cover up their wallpaper, for example. Today, we're going to look at a method to keep your desktop as spartan as possible so that all you see when you boot up your PC is a pristine background image. Here's how to do it in Windows 8.1. The first thing you're going to want to do is get rid of any files sitting on your desktop. Sometimes this is harder said than done, because there are files that defy any logical categorization. For those digital odds and ends, I have a folder in my documents library called Junk Drawer. That's where I keep everything that doesn't really belong anywhere else. A similar folder might work for you. Next, dump all the shortcuts sitting on your desktop. You really don't need them. Any apps you need quick access to are better off being pinned to the taskbar. If you're using your desktop to stash website bookmarks, learn to love your browser's bookmarks toolbar. 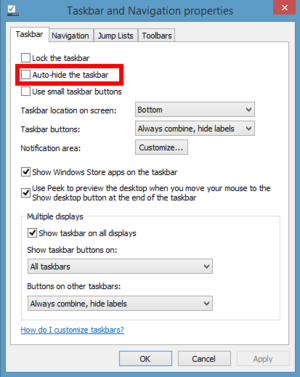 Hide the taskbar using its properties dialog. The second thing we'll want to do is hide the taskbar so it only appears when you drop your mouse cursor to the bottom of the screen. Right-click on the taskbar and select Properties. 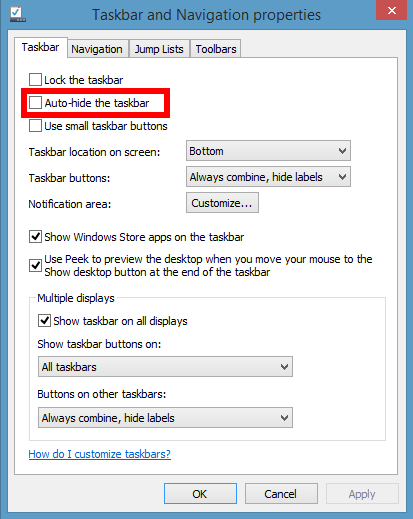 Under the first tab entitled Taskbar check the box next to Auto-hide the taskbar, then click Apply and OK. Your taskbar is now gone until you call it back. To test this, drop your mouse down to the bottom of the screen and watch the taskbar pop back up again. Now we should be left with the Recycle Bin, and any system icons such as your user folder, Network, This PC, and so on. There are two ways to do get rid of these, but I'm going to show you the easiest one. If you want to see the slightly more complex version check out Microsoft's help pages. One-click and you can hide everything on your desktop. Right-click on your desktop and select View > Show desktop icons. Did you notice how everything on your desktop suddenly disappeared? 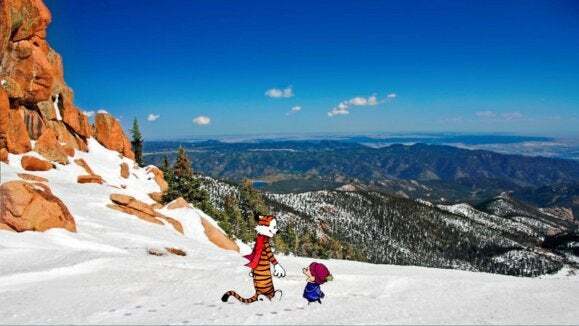 Great, you're done. You could actually use this trick to hide everything including your personal files and get a pristine desktop in one move, but that's not very organized. If you ask me, you're better off organizing any files left on your desktop first. The one problem with this trick is that it also hides any future files you might save to the desktop as well. But even if you do save something to the desktop you can always find it again by visiting the desktop inside File Explorer. Now you've got your pristine desktop, but how are you going to throw things out? Right-click any file or folder and select Delete to send it to the Recycle Bin. But that brings up another problem: How do you empty the recycle bin? You can still get to the Recycle Bin by opening File Explorer and selecting Desktop under Favorites in the left-hand navigation column. From there just right-click and select Empty Recycle Bin as always. You can set the limit on how large your Recycle Bin gets. Another alternative is to limit how much trash your Recycle Bin can hold. Right-click the Recycle Bin from your Explorer window and select Properties. Under Settings for selected location you should see the Custom size radio button selected and a number such as 17292. That number is in megabytes. 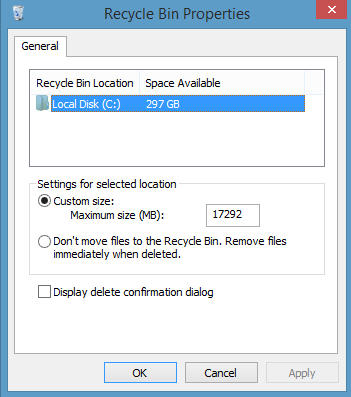 What it says is that once the Recycle Bin reaches that 17,292 megabytes (that's 16.8 gigabytes!) limit, Recycle Bin will automatically delete its oldest files to keep some space in your trash. You can change that number to any value you'd like to make it delete files sooner and take up less hard drive space. If you wanted to limit the Recycle Bin to 2GB, for example, you'd change the number to 2048. The downside of this approach is that whenever you try and delete a file larger than 2GB, Windows will have to permanently delete the file and not send it to the Recycle Bin. That may be a problem if you are prone to restore files you accidentally threw out. If you really want that pristine desktop, it will take a little getting used to since you have to change (slightly) how you throw out files. But for anyone who wants the cleanest desktop possible, it's a small price to pay.